Create colored PDF files from any windows application for free. No banners nor any annoying restrictions! Just download and install Doro. After installation you have an additional printer called ‘Doro PDF Writer’. 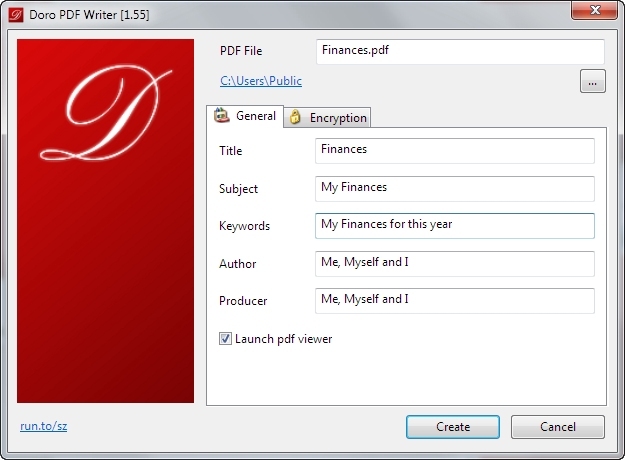 Encrypt the PDF file with 128-bit password protection. Also ‘copy and paste’ and printing can be prevented. Doro is working on Windows 8.1 [32 and 64 Bit], Windows 8 [32 and 64 Bit], Windows 7 [32 and 64 Bit], Vista [32 and 64 Bit], Server 2012, Server 2008, Server 2003 [incl. Terminal Services / Citrix XenApp with multiple concurrent users] [32 and 64 Bit], XP [32 and 64 Bit], 2000, NT4 and Windows ME, 98SE, 98, 95. 3,550 7,560 The SZ Apr 15, 2015 - 21:53 2.01 16.15MB ZIP , out of 16 Votes.